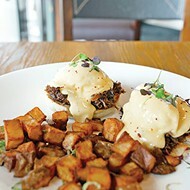 Oklahoma City chefs provide some of their favorite holiday tricks that elevate traditional recipes. 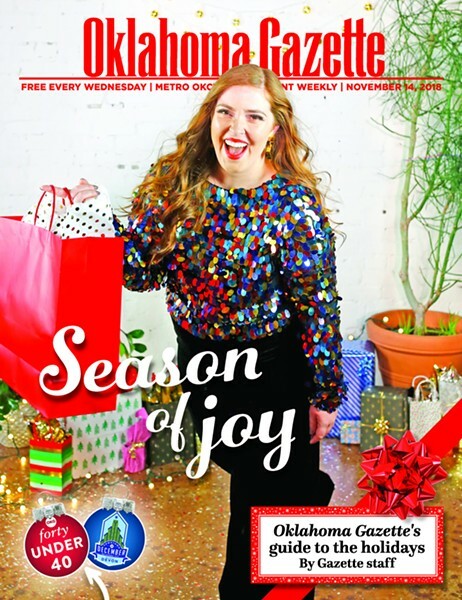 In preparation for this holiday season, Oklahoma Gazette asked chefs from some of the best restaurants in the city to provide recipes they like to make at home for the holidays. They provided a few techniques that will put a twist on holiday classics. 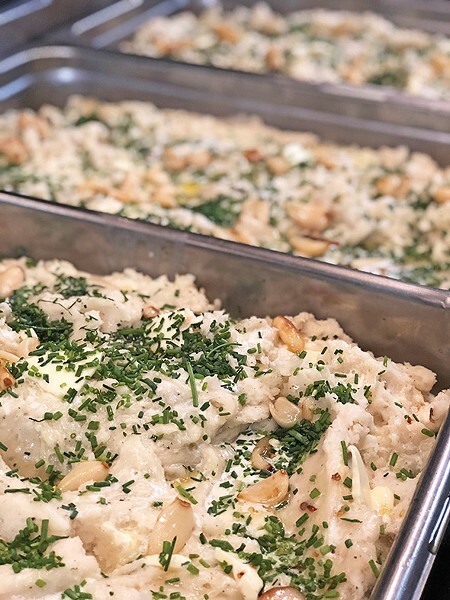 Chef Melissa Aust is the executive chef at Stella Modern Italian, 1201 N. Walker Ave., where coming up with modern twists on classic dishes is a staple of Stella’s modern Italian menu. 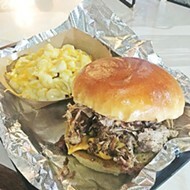 The technique of salt-encrusting creates a tight seal around meat, sealing in flavor and juices during the cooking process. The salt shell creates a cooking method that is simultaneously roasting and steaming for a memorable holiday centerpiece like prime rib. The recipe requires a good meat thermometer placed into the center of the prime rib. Aust cautioned that even though the center temperature of 110 degrees Fahrenheit is below medium rare, the prime rib will continue to cook inside that salt shell as it rests for at least 30-40 minutes. You will need to buy a thermometer because you only want to let it cook to 110 degrees Fahrenheit in the center and let it rest; that way, the juices soak back in and and don’t overcook it. The end pieces will be more cooked, and the center is medium-rare. Aust also provides her tasty take on mashed potatoes, which can substitute olive oil if you can’t find duck fat. Preheat oven to 400 degrees Fahrenheit. Place the salt, water and herbs in a large bowl and mix until the herbs are evenly incorporated. Add more water if needed; a fist full of salt should hold the shape of a ball when squeezed. During the process, continue mixing the salt, as the water will settle at the bottom of the bowl. On an oven-proof sheet pan or dish, layer salt approximately 1/2-inch thick as a base for the prime rib. 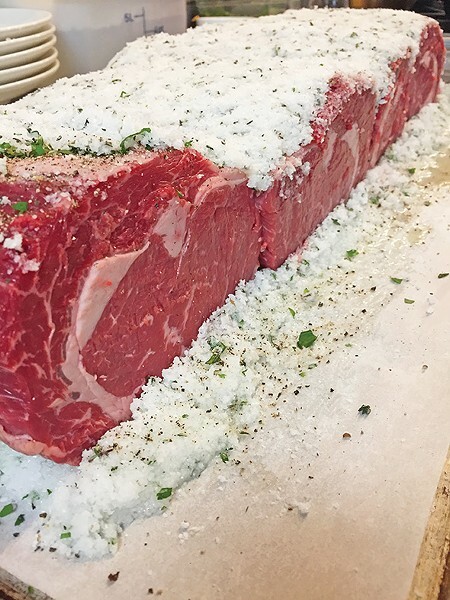 Continue to pack the salt around the prime rib until it is completely covered and no meat is showing. Let it rest for 15 minutes and fill in any cracks that appear. Place an ovenproof thermometer into the center of the prime rib. Place the dish in the preheated oven and cook for approximately one hour or until the thermometer reaches 110 degrees Fahrenheit. Remove the dish from the oven and let it rest for 20 minutes. 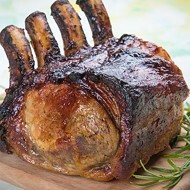 Crack the crust off the prime rib and, using a clean towel, brush off any salt that is on the meat. Place it on a cutting board for slicing. Jason Campbell is the executive chef at Mary Eddy’s Kitchen x Lounge. For the holidays, he keeps this recipe on hand at all times. It requires having a conversation with your local butcher to procure cut beef bones, but Campbell swears by this take on classic French onion soup that serves six to eight guests. The first step is to roast the three bones in the oven — be sure to put them in a pan with a lip to collect the fat. Roast the bones for 45 minutes or until they’re nice and golden brown. Once the bones are roasted, add the rendered beef fat to a heavy-bottomed pot or a Dutch oven over medium heat and cover, saving the bones for later in the recipe. Add the sliced onions and some salt and start to sweat the onion; you’re not looking for any color. Once the onions start to soften, place a lid on the pot and cook the onions for 45 minutes or until they are really soft and tender, stirring every 10-15 minutes. This step is very important to help the onions caramelize more evenly. After the onions are soft, remove the lid, and there will be some liquid from the onions, which is fine. Turn the heat to low and start to caramelize the onions (this will take 2-4 hours), stirring every few minutes to prevent sticking — it’s worth it! Put on some music and enjoy some adult beverages. You want the onions to break down and become a paste and no longer resemble onion (the steaming of the onions helps this). Once they are dark, rich and sweet, add the thyme bundle, the three reserved bones and the beef stock. Cook over medium-low heat and lightly simmer for two more hours (the bones will add a richness and help the beef stock), and the soup should be a dark brown. After two hours, add salt to taste and a liberal amount of pepper to the soup, turn the heat to low to keep the soup warm and remove the thyme bundle and bones. To finish the dish, crank the oven to 450 degrees Fahrenheit. 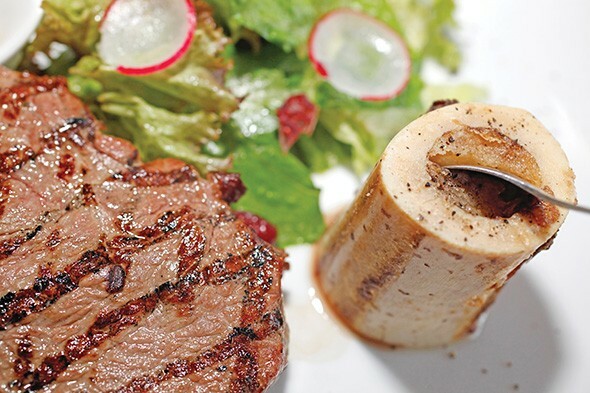 Take the remaining marrow bones and season them with salt and pepper and roast them on a sheet pan with a lip in the oven for about 10 minutes or until the center of the marrow is soft but not rendered away. You can check with a cake tester or a paring knife. (Insert it into the marrow for 10 seconds. If the tester is warm to the touch, you are good to go.) Be careful, as there will be fat in the pan. Save the fat to either toast the bread for the soup or reserve it in your fridge to roast potatoes or even make a beef fat hollandaise for a nice steak or prime rib. Next, brush olive oil or the reserved beef fat, salt and pepper on the bread and toast it in the oven until crisp but still a bit soft, maybe five minutes. Place a warm bowl on the side. In a warm bowl, place the roasted bone marrow in the middle of each bowl, ladle the soup into the bowls around the bone and give it a few more cranks of pepper and some fresh picked thyme. Have some small knives to scoop out the bone marrow and place it on the bread to dip in the soup! Enjoy! Place the oil and the garlic cloves in a small pot and cook over low heat for about an hour until they are soft and golden in color. Remove the garlic from the oil, mash it with a fork and set it aside. Melt the butter in the warm cream. Place the potatoes in water and boil them until they’re soft in the center, strain them in a colander and return them to the pot. In small batches, add the cream and butter to the potatoes and mash them until they turn creamy. Add the salt, pepper, mashed garlic and rosemary. Mix until the herbs are completely incorporated and adjust the salt if needed. Chef Shelby Sieg is the mastermind behind The Pritchard’s small plate menu that always delivers, even as it changes to add seasonal ingredients. 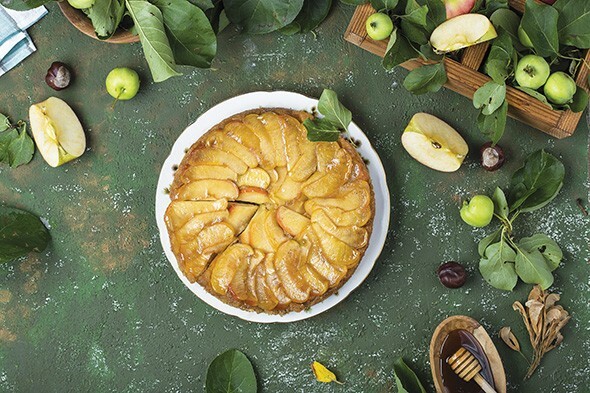 Over the holidays, odds are you will run across at least one apple pie, but she recommends giving this French technique a try for something similar, but a little different. Roll out the puff pastry to a 10- to 11-inch circle, about 1/8 inch thick; transfer it to a baking sheet and chill until firm, about 30 minutes. Preheat the oven to 375 degrees Fahrenheit. Line a baking sheet with parchment paper, and set it aside. Core the apples and cut them into quarters. Transfer them to a large bowl. Squeeze lemon over the apples and set them aside. Combine the sugar and water in a 9-inch cast-iron skillet. Bring the mixture to a boil over medium-high heat; immediately reduce the heat to medium and cook the mixture until it begins to thicken and turn amber. Remove it from the heat and stir in the butter. Place the apples in a skillet. Decoratively arrange the apples in the skillet. Continue layering slices until they are level with top of the skillet. Cut any remaining apples into thick slices to fill in gaps. If the fruit does not completely fill the pan, the tart will collapse when inverted. Place the skillet over low heat and cook until the syrup thickens and is reduced by half, about 20 minutes. Do not let the syrup burn. Remove the skillet from the heat and let it cool. Place the puff pastry over the apples and tuck in the edges. Place the skillet on the prepared baking sheet, place the baking sheet in the oven and bake until golden brown, about 35 minutes. Remove the skillet from the oven and place it on a wire rack and let it cool 15 to 20 minutes. Loosen the pastry from the skillet using a sharp knife. 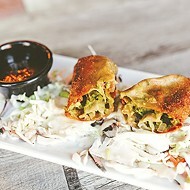 Place a rimmed platter over the skillet and quickly and carefully invert the dish onto the platter. Serve immediately. Beth Ann Lyon has developed the menu at many places across the city: The Mule, Anchor Down, The Press and Provision Kitchen. The alumnus of Kurt Fleischfresser’s Coach House program and French-trained chef puts an onus on intuitive eating, which emphasizes plant-based and local ingredients. When she does cook with meat, she advocates for humane and antibiotic-free proteins. 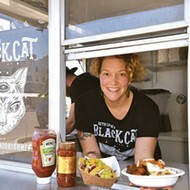 You’ll be able to taste Lyon’s blend of plant-based and mindful meat options at her own restaurant, The Black Cat, which became the first micro-kitchen announced at The Collective, which will open at 308 NW 10th St. in early 2019. 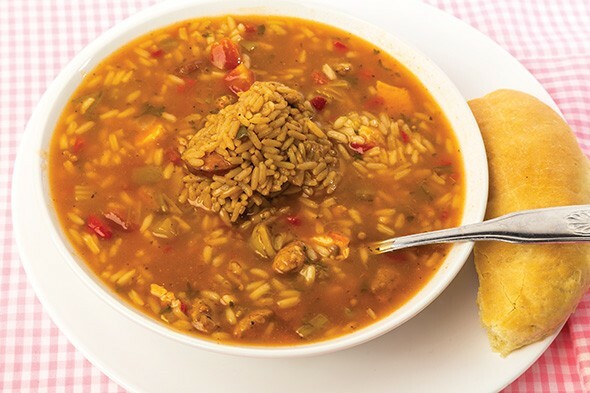 Lyon’s family is from Louisiana, and she is a fan of a quick and easy, rouxless gumbo that is prepared in one pot. She adds thickness to the dish by cooking the okra for hours and adding a large helping of filé powder. Place four pasture-raised turkey breasts in a container with brine overnight. Place all of the ingredients in a large Dutch oven, cover it with foil and cook it in an oven at 350 degrees Fahrenheit for four hours. After cooking, uncover the dish and salt and pepper it to taste. Pour it over wild rice or cornbread. Garnish it with pomegranate seeds and more hot sauce. After you eat it, don’t fuss over Thanksgiving ever again. As a matter of fact, travel next year!